One clear finding from several long-term regulator usage studies is the importance routine maintenance can play in keeping your regulator at peak performance. Students that take the PADI Equipment Specialty course quickly see the benefits of following the manufacturers' recommendations for regular servicing. The small investment in maintaining your life-support gear can pay big dividends in performance. The price of the replacement parts kits for most regulators may range from about $20 to $60, but many warranties cover the cost of parts if you service your regulator at the recommended intervals. Labor charges are an additional charge, but usually run about $60 to $70 depending on the regulator. How much labor is involved? 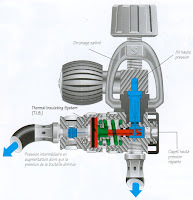 It depends on the regulator design and the condition the regulator is in when it comes into the shop. Here is the procedure commonly used by a shop for annual service. The shop will usually start with an external check for corrosion, cracks, and missing or misplaced parts. They remove the mouthpiece and see if it needs replacing. 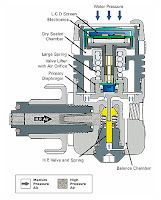 Then the first stage is attached to a cylinder valve that is adjusted to 3,000 psig. The intermediate pressure (IP) and the Magnehelic reading of the cracking effort (CE) are recorded (more on that later). Next the technician will usually review the regulator's service manual and note procedures for disassembling, cleaning, re-assembling, tuning and check for any service bulletins warnings, cautions or notices. The unit is then completely disassembled, making note of corrosion and worn or broken parts. All parts are placed in an ultrasonic cleaner to remove any corrosion (that blue & green gook) rinsed in water and then blown dry. Assembly is performed per the instructions in the service manual, using the manufacturer's service kits. All dynamic (those on moving parts) O-rings are replaced, and nowadays even the static O-rings are usually replaced. The valve seat is also replaced. On both piston and diaphragm regulators the high pressure air is managed by a high-tech composite valve seat against a knife edge. That seat will wear with usage, and is replaced so you don’t get any seepage or leakage. Once assembled the tuning is done in accordance with the manufacturer's specifications. The first stage is tuned at a low pressure (500 psig or 750 psig depending on Mfg) and then at high pressure (3,000 psig). The unit is then may be put on a Set Seat and Poppet fixture to break-in the high pressure (HP) and low pressure (LP) valve seats. After the seats are broke-in, the second stage is checked for leaks (a leaky diaphragm or box will breathe wet). Final tuning is often performed with the regulator immersed in water, and with the inhalation control knob (if applicable) and the Venturi switch set to the manufacturer's recommendation. The second stage is placed in the water in dive position (face down). The unit is adjusted until there are no leaks. After final adjustment, the unit is placed on a flow analyzer to determine if it is performing properly by fine tuning the second stage to a cracking pressure of 1.5” to 2” of water. All tests are conducted at 500 psig and at 3,000 psig. You can test this at home by putting your second stage in water with the mouthpiece up and it should start to crack once the diaphragm is just over an inch submerged.